Minimalist – Joshua Tree – Atlas Supply Co. 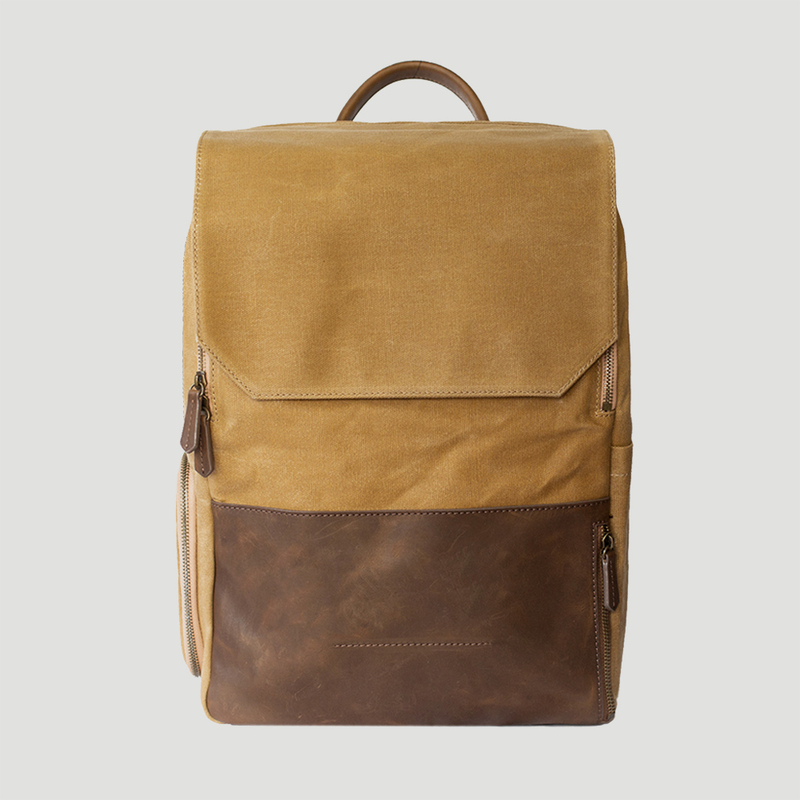 The Minimalist is the perfect backpack for anyone who wears multiple hats, but doesn’t want to wear multiple bags. The separate laptop section holds up to a 15″ laptop with padded siding & bottom for extra protection. This is also a great section for books, papers and folders. The main compartment can be secured with a zipper and a magnetic flap. There are two inner pockets large enough for an ipad mini. The inside features what we’ve coined “the shelf”, a removable piece of padding that separates the inner section in half. (We swear by the bottom section for camera gear, diapers and shoes to name a few.) The bag also features a removable vertical divider to secure fragile items such as camera equipment. The bottom section features a side access pocket, perfect for getting to those items you need without having to take the bag off. The passport pocket is large enough for keys/iphones/wallets/gum and any other small items you are in constant need of and need quick access to. The canvas backpack is perfect for adding pins and patches! Laptop pocket fits up to 15″ laptop. Passport pocket fits up to Iphone 8+. iPad pockets fit up to iPad Mini. Camera pocket 10 inches deep. This pack is made from canvas and is lightly pretreated with wax. We include a 1 oz. leather cream with every order to waterproof your pack and replenish oils when necessary. Refills will be available for purchase in the shop. Ditch your other bags and use an Atlas for your carry on, respond to emails in the woods, take your gear with you to the streets, and everything in between. If you’re not obsessed by day 30, you can ship your order back for a full refund, no questions asked. I love my Joshua Tree Minimalist BackPack! It’s my go-to bag for work and work trips. I get tons of compliments, almost anywhere I go out in public. Now, I am just waiting for a matching large day pack! (hint-hint). I absolutely LOVE mine!! Looks amazing with anything I wear and is so durable!! Currently traveling with it for the holidays! I have a camera, three lenses, an iPad, MacBook, snacks, a sweater, water and 3 different chargers in here haha… idk how you guys did it. This is my fav backpack lol, my other technical backpacks are an eyesore. The ultimate pack ?? fits and keeps everything I need for work protected and easily accessible (laptop, hard drive, camera + extra lens) and still leaves plenty of room for my keys, wallet, notebook and most importantly snacks. I’ve taken it camping and it’s a perfect size carry on. The pockets make it easy to get anything you need out without having to take it off. I feel like a ninja. Between the super light weight canvas and the padded straps it’s like wearing a cloud! It’s Prettaay prettaayy prettay good! Funny enough, I’m wearing the backpack while writing this review in a coffee shop 🙂 I love that I can use it for everything. There’s room for diapers, my giant MacBook, a water bottle, snacks, and a change of clothes! The best part is when I’m carrying a full bag, the straps are comfortable enough that it doesn’t dig into my shoulders. Also, I get compliments left and right. It’s seriously the best! I AM OBSESSED WITH THIS BAG. I’m a super backpack snob, I’ve tried a lot of them and spent a good amount of money to find the right one. I was settling with my Langly backpack until I got this one. Best one I’ve ever used. Looks amazing, customizable in use and look(hello patches!) and is the perfect size. Fits all my camera gear and baby gear. LOVE LOVE LOVE this bag. When I saw that there was a canvas version of the entrepreneur, I knew I had to have it. It’s perfect for the more adventurous creative. The canvas makes it easy to clean and it stands up well to camping and hiking. There’s plenty of space for all my gear and more! Best part about the canvas- being able to apply patches!!! Mine is covered with patches from all the national parks I visit. 10/10 bag. 10/10 would recommend to a friend. This bag is wonderful! Great for quick trips or work. I use it every time I travel. It fits everything! Computers, clothes, books, my gameboy, plus any other necessity you could think of. Everything has an accessible place for total ease of use. It’s light weight but durable. The canvas makes for fun customization as patches and pins can easily be added making it totally unique. can’t recommend this bag enough! Couldn’t ask for a more functional, attractice, and sturdy backpack! It’s got room for everything: my books, iPad, medical equipment, and everyday items. When I’m not in school, it easily transitions into a travel bag. The best purchase I’ve made in a while!